Tankōbon (単行本, "independent/standalone book") is the Japanese term for a book that is complete in itself and is not part of a series or corpus. In modern Japan, though, it is most often used in reference to individual volumes of a single manga, as opposed to magazines (雑誌, zasshi), which feature multiple series. The largest imprint labels for manga tankōbon publications include Jump Comics (for manga originally serialized in Weekly Shōnen Jump and other Jump magazines), Shōnen Sunday Comics, and Shōnen Magazine Comics. This Japanese tankōbon edition of Love Hina volume 11 is smaller than this English tankōbon edition of Genshiken volume 8. Increasingly after 1959, manga came to be published in thick, phone-book-sized weekly or monthly anthology manga magazines (such as Weekly Shonen Magazine or Weekly Shōnen Jump). These anthologies often have hundreds of pages and dozens of individual series by multiple authors. They are printed on very cheap newsprint and are considered disposable. Since the 1930's though, comic strips had been compiled into tankōbon collecting multiple installments from a single series and reprints them in a roughly paperback-sized volume on higher quality paper than in the original magazine printing. Strips in manga magazines and tankobon are typically printed in black and white, but sometimes certain sections may be printed in color, or using colored inks or paper. In English, while a tankōbon translation is usually marketed as a "graphic novel" or "trade paperback", the transliterated terms tankoubon and tankōbon are sometimes used amongst online communities. Japanese people frequently refer to manga tankōbon by the English loanword "comics" (コミックス, komikkusu), although it is more widespread for being used in place of the word "manga", as they are the same thing. The term also refers to the format itself—a comic collection in a trade paperback sized (roughly 13 × 18 cm, or 5" × 7") book (as opposed to the larger 18 × 25 cm / 7" × 10" format used by traditional American graphic novels). Although Japanese manga tankobon may be in various sizes, the most common are Japanese B6 (12.8 × 18.2 cm, 5.04" × 7.17") and ISO A5 (14.8 × 21.0 cm, 5.83" × 8.2"). The tankōbon format has made inroads in the American comics market, with several major publishers opting to release some of their titles in this smaller format, which is sometimes also called "digest format" or "digest size". In the United States, many manga are released in the so-called "Tokyopop trim" or "Tokyopop size" (approximately 5" × 7.5"). An aizōban (愛蔵版 lit. "favorite printing edition") is a collector's edition volume . These volumes are generally more expensive and lavished with special features such as special covers created specifically for the edition, special paper used for the cover, higher quality paper, a special slipcase, and so on. Aizōban are generally printed in a limited run, thereby increasing the value and collectability of those few copies made. The aizōban format has begun to make inroads into the US market, with titles such as Fruits Basket, Rurouni Kenshin and Mobile Suit Gundam: The Origin being reissued in aizōban format. Generally only the most popular manga are released in this format. Not to be confused with Bunkobon. A bunkoban (文庫版) edition refers to a tankōbon printed in bunko format, or a typical Japanese novel-sized volume. Bunkoban are generally A6 size (105 × 148 mm) and thicker than tankōbon and, in the case of manga, usually have a new cover designed specifically for the release. In the case of manga, a bunkoban tends to contain considerably more pages than a tankōbon and usually a republication of tankōbon of the same title which may or may not have been out of print. Thus, the bunko edition of a given manga will consist of fewer volumes. For example, Please Save My Earth was published in 21 tankōbon volumes, and then re-released in 12 bunko volumes. If the original manga was a wide-ban release, the bunkoban release will generally have the same number of volumes. The term is commonly abbreviated in Japanese to just bunko (without the -ban). The kanzenban (完全版 lit. "complete edition") is another term sometimes used to denote this kind of a special release. A kanzenban release is generally A5 size (148 × 210 mm) and will typically reproduce individual chapter covers, color pages, and side-stories from its original magazine run, features that are often omitted or converted to grayscale in standard tankōbon releases. While the aizōban appellation emphasizes the value of the volumes, the term kanzenban emphasizes their completeness, though it is likewise generally reserved for popular manga such as Dragon Ball. Similar to a wide-ban, a shinsōban (新装版) is a new edition released with (usually) a new cover. The volumes in such a release usually have new color pages and other extras. For example, in 2002, Sailor Moon was reedited; some pages were completely redrawn and most dialogues were rewritten by the author. Plus, the chapters were redivided to fit into 12 volumes instead of 18. The sōshūhen (総集編 lit. "complete collection") is a relatively new format published by Shueisha beginning in 2008. A sōshūhen edition is B5 size (176 × 250 mm), larger than a kanzenban, and similarly reproduces chapter covers and color pages while also including a variety of bonus features such as posters and interviews. 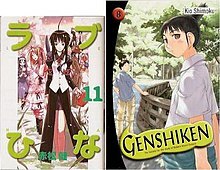 The majority of sōshūhen releases are for popular manga with ongoing serializations. They also contain far more pages than a standard tankōbon and thus feature more chapters in fewer volumes; Naruto Part I was originally published in 27 tankōbon volumes, but was completed in just eight sōshūhen volumes. A wide-ban or waidoban (ワイド版) edition is larger (A5 size) than a regular tankōbon. Many manga, particularly seinen and josei manga, are published in wide-ban editions after magazine serialization, and are never released in the tankōbon format that is common in shōnen manga and shōjo manga. When a series originally published in tankōbon format is re-released in wide-ban format, each volume will contain more pages than in the original edition, and therefore the series will consist of fewer volumes. For example, Maison Ikkoku was originally released in 15 tankōbon volumes, but was republished as 10 wide-ban volumes. ^ Paul Gravett (2004). Manga: Sixty Years of Japanese Comics. Harper Design. p. 8. ISBN 1-85669-391-0. ^ Frederik L. Schodt (1986). ' Manga! Manga! The World of Japanese Comics. Tokyo: Kodansha. ISBN 978-0-87011-752-7. ^ Jason Yadao. The Rough Guide to Manga. ^ Brienza, Casey E. (June 2009). "Books, Not Comics: Publishing Fields, Globalization, and Japanese Manga in the United States". Publishing Research Quarterly. New York: Springer. 25 (2): 101–17. doi:10.1007/s12109-009-9114-2. ISSN 1053-8801. Retrieved March 12, 2010.